No Power: My Ouya simply does not turn on. I press the button and no light, no anything! Before you panic and think of the worst case scenario that your Ouya is totally gone it may not be receiving no power from your power supply. I had a friend which had a defective 12v power supply for their Ouya, I took a volt meter to the barrel plug of his power adapter it was was only reading something like 0.6volts! Test out your Ouyas Power supply first with a multi-meter if you have one. If it is defective you can pick up a universal PSU from radio shack or Ebay so long as it delivers an Output of 12 volts and 1.5 amps. If the amperage is less then 1.5 amps the Ouya may have issues crashing while playing games. If it is your power supply that is defective and it’s providing no power to your ouya there is plenty of power supplies to choose from out there and some you may be able to scavenge from other equipment that is no longer in use or just broken around the house. Just be mindful of the polarity of the power supplies that you hook up to your Ouya. 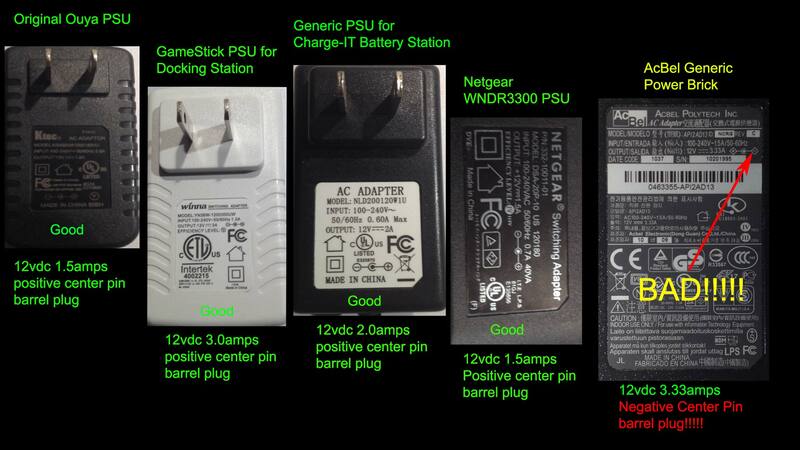 Failure to hook up a power supply with the wrong polarity like the one pictured in the far right (where the center pin is negative and the outside barrel is positive) can result in permenant damage to your Ouya Console. The micro-USB port on the Ouya. This is the next method to figure out what is wrong with your Ouya that produces no power light or display. The micro-USB port will actually tell you what is going on with your Ouya a lot faster then the idiot light that is on top of your Ouya. While having your device manager (or in linux dmesg) running. Plug a micro-USB cable into the back of your Ouya and then into your computer. Then Power up the Ouya. Note: It might not turn on the light on the top of your Ouya but it may show up on dmesg or device manager. Ouya or Ouya1.1 – device not found – This is the typical response you will get from Ouya in your device manager as the Ouya operating system immediately places it into ADB mode for you. MTD – Windows cannot install device – Otherwise known as Androids “Media Transport Device” This means that the android portion of the OS loaded, but it cannot power up completely as a result of a failed system update (i.e. softbrick) the way to get around this is to launch the Ouya Recovery with a usb keyboard plugged in ALT + PrtScrn + I and after your screen flashes a few times Home button. If you can get this far with your Ouya then it just needs a firmware update and your ADB driver installed correctly and your Ouya will be good as new. If the MTD option was working perfectly you would be able to see your Ouya plugged in happily and visible as a media device on your PC. APX – This is one of the more terminal errors of Ouya. APX as described here is the fallback system for the NVidia error-debug mode when the bootloader fails to accomplish its task. On a typical android environment setup you can disable APX by simply rebooting your device and hold the volume up as you power up on your android device. Ouya has no volume up! Sometimes you’re able to get into your Ouya by holding down the power button as you plug it in but it doesn’t always work. Until Ouya releases a recovery.zip that repairs the bootloader partition of their Ouya or releases the firmware so it can flashed via APX using the NVFlash tool many Ouya users are left stranded with the only way to fix it is to send it into Ouya. And if your Ouya is out of the manufactured date then it means you have a dead box essentially. No response or device change – Your Ouya is truly dead at this level.